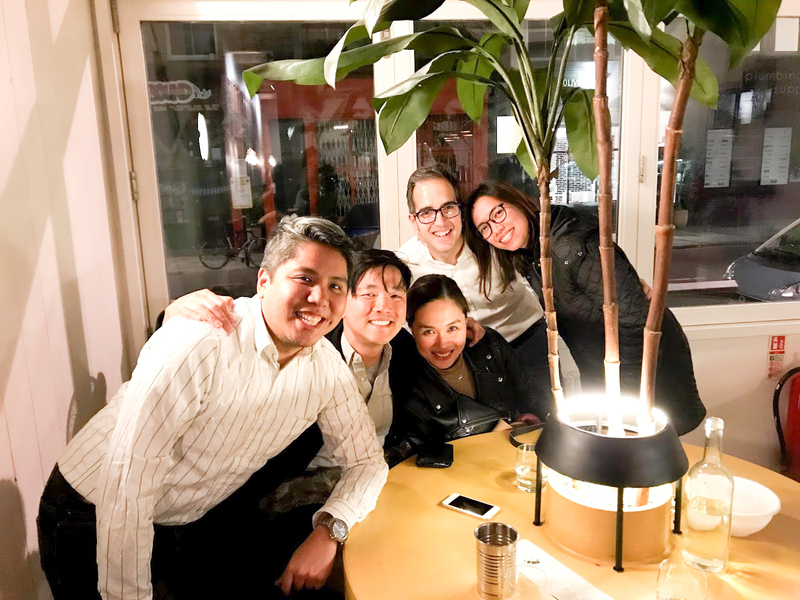 We met up with some friends for dinner at Mam, a relatively new Vietnamese joint at Notting Hill. Getting there was pretty easy. It’s a 6 minute minute walk from Westbourne Park London station and the Portobello Road Market. There are several bus stops around and one right across the street. It’s been a while since we’ve had proper Vietnamese food because there aren’t many legit Vietnamese places in London. 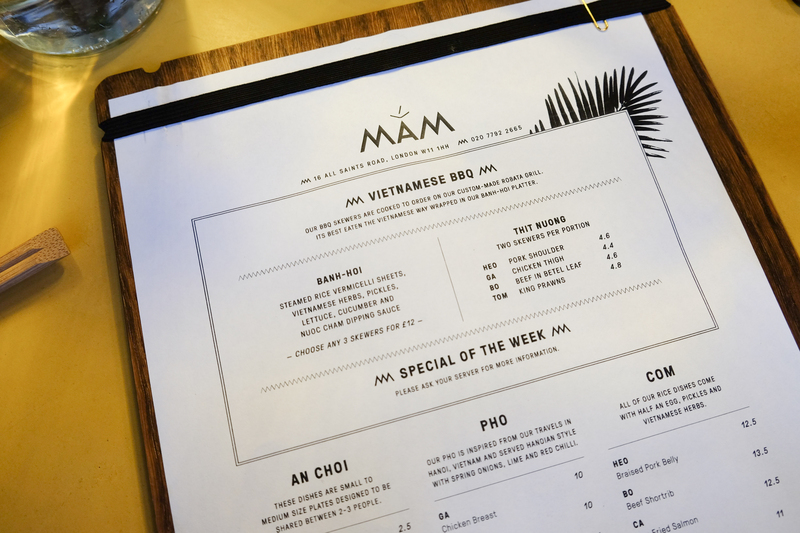 Mam is owned by the team behind Salvation in Noodles, a popular pho place in East London. 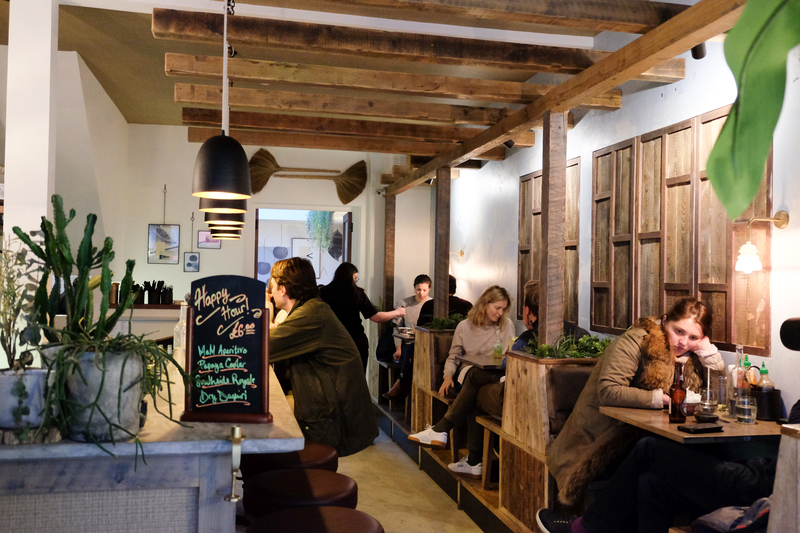 Their new restaurant is inspired by the barbecue street food stalls in Vietnam. 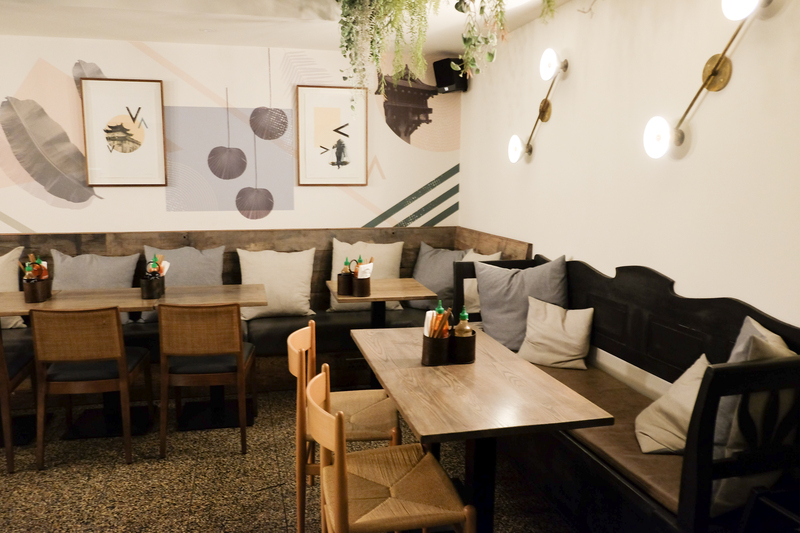 The interiors are homey and I personally love the decor – minimalistic with a slightly Scandinavian / tropical vibe (sounds weird, but it works). We were greeted by a long bar where they serve a good variety of drinks and cocktails. We were seated by the front window, which would have been nice on a warm day – but it was an uncharacteristically cold spring day so we were getting a draft every time the door opened. It was a relatively quiet night so it didn’t bother us too much. Our table had the largest centrepiece I’ve ever seen so we had to peer through it/the plant to talk to each other, which was a bit strange but provided a good laugh for everyone at the table. They also didn’t have a coat rack / hooks so we had to sit with our coats on our laps – the server shared that they were still figuring out the best coat solution for the place. Overall, pretty good – but again, it was a quiet night. We just had to wait longer than usual for an additional order of skewers. Everyone loved this. We had it with prawns. The omelette was perfectly warm and crispy and perfectly seasoned. This was definitely fresh but was a bit lacking in flavour compared to all the other dishes. I’m sure a lot of people would love this though, especially if you’re not a fan of strong flavours. Our favourite of all the dishes. The meats were cooked and seasoned perfectly. They were so flavourful and perfectly matched the freshness of the veggies and rice vermicelli. The sauce was also really good especially when drizzled on pickles, cucumber, carrots, rice noodles and some meat wrapped around a lettuce leaf. Pho-Tom (£12.5). 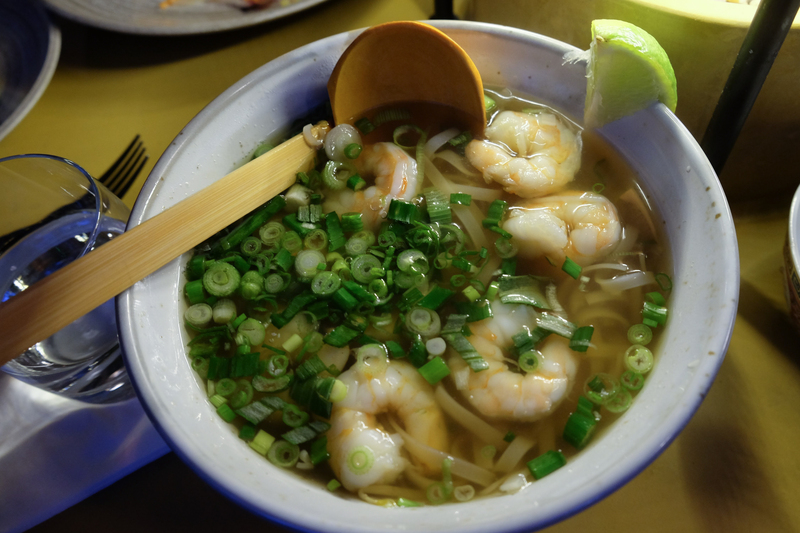 Vietnamese prawn noodle soup served Hanoian style with spring onions, lime and red chilli. 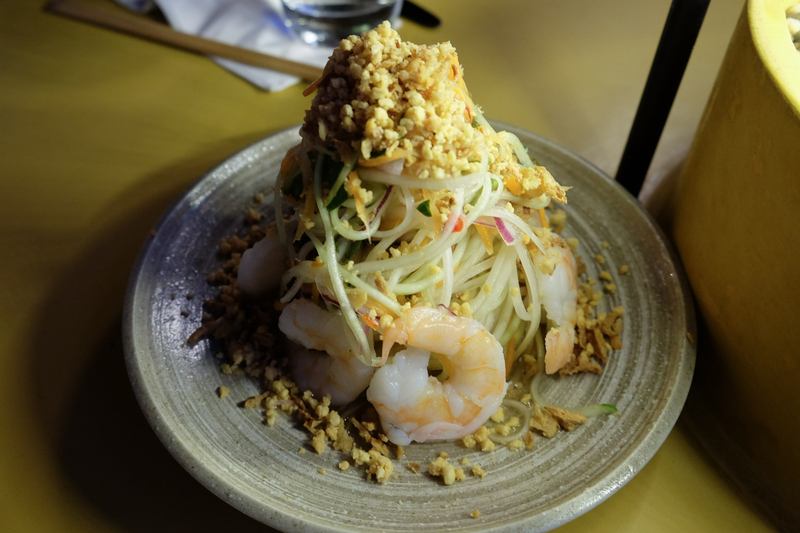 Similar to the papaya salad, I found this tasted fresh and clean but lacked a bit of flavour. I don’t think this is the restaurant’s fault though – I’m pretty sure this is what prawn pho is supposed to taste like. I just like my flavours stronger. Com-Heo (£12.5). 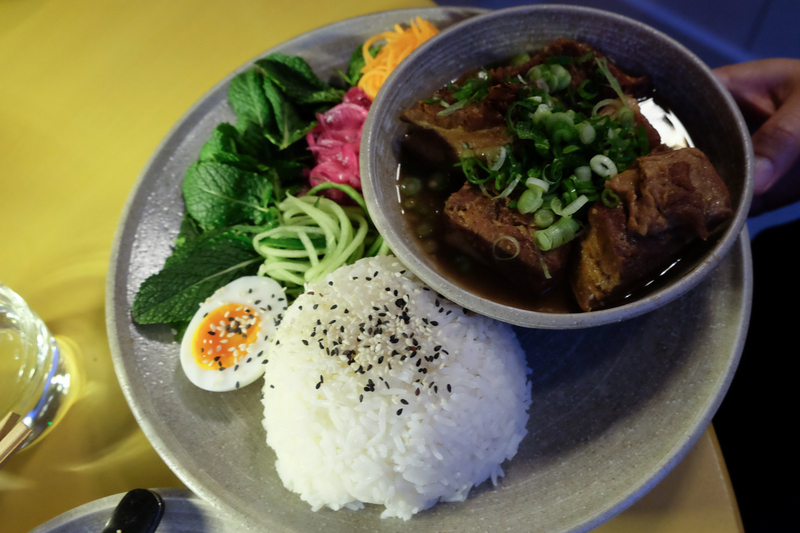 Pork belly on rice with half an egg, pickles and Vietnamese herbs. Properly fatty pork belly in a slightly sweet sauce which reminded me of a less salty pork adobo. The meat was tender and the sauce paired perfectly with the white rice. I’m not a huge fan of pork so I only had a taste but everyone else liked it. We were too stuffed to order any dessert at this point. I would definitely try the black sesame ice cream with coconut sago next time though. Our rating: 4 out of 5. 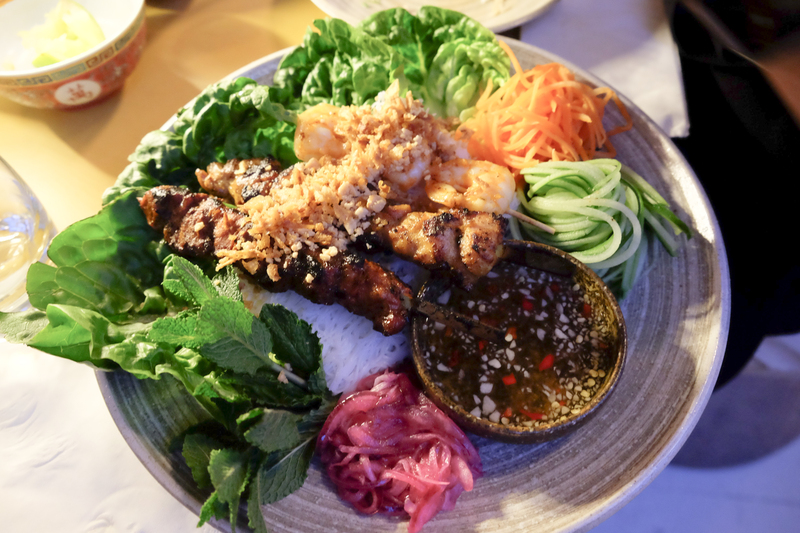 We loved the flavours of the barbecue and the best Vietnamese I’ve tried in the UK so far. 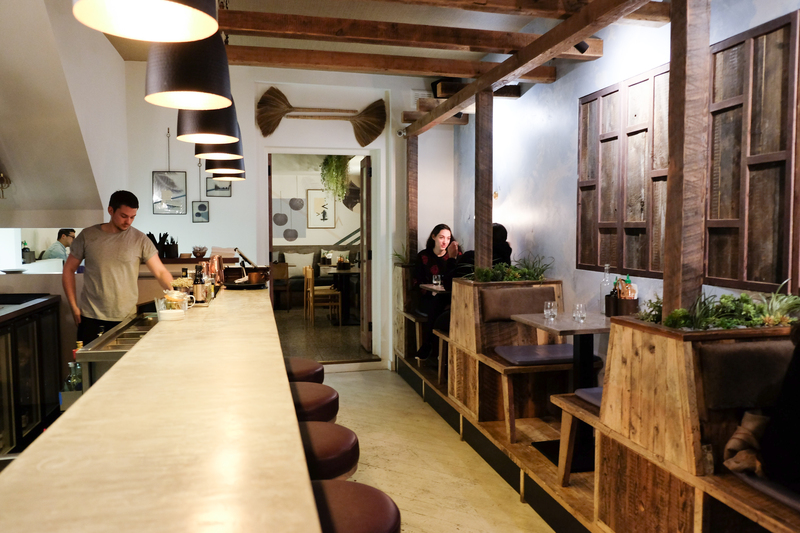 Come on a weekday to avoid crowds and get better service. Our kids would definitely love the pho (Noodles with subtle flavours? Yup.) The place is a bit cramped so a buggy would be hard to manoeuvre inside. A few other reviews mentioned slow service on busy nights so I would suggest waiting a few more months before trying this place out on a weekend – unless you’re prepared to keep your children busy while waiting for the food. 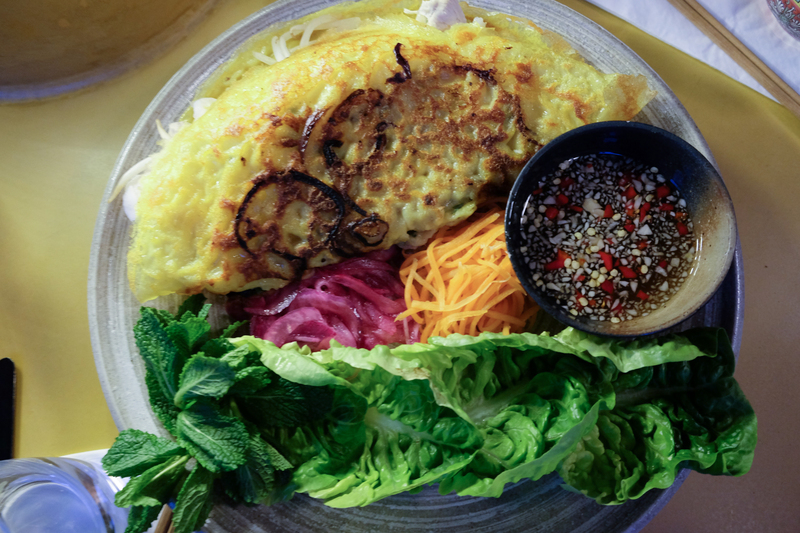 Have you tried any good Vietnamese restaurants lately?